Ada Bird Petyarre emerged as a seminal participant in the ‘Summer Project’ organized by the Central Australian Aboriginal Media Association CAAMA in 1988. This workshop was to play a vital role in introducing women into what was, at the time, a male dominated activity. She was born around on the old Utopia station at Atnangkere c. 1930. An Anmatyerr speaker, and now one of the senior women at Utopia she is best known for her renditions of Awelye for Arnkerrthe (women's ceremonial body paint designs for the Mountain Devil Lizard), a Dreaming she shares with Kathleen Petyarre. 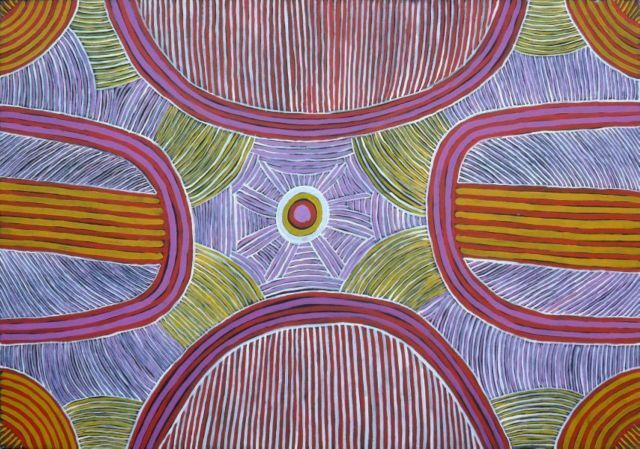 Yet she also paints a variety of other Dreaming images including Bush Bean, Emu, Pencil Yam, and Grass Seed in common with Emily Kngwarreye, Gloria Petyarre and Violet Petyarre and a number of other painters of the region. Having created batiks since the first workshop at Utopia in the late 1970’s she was immediately recognized for her important cultural role and her talent as an artist at the time she began painting. The National Gallery of Australia in Canberra acquired a major canvas in 1989 followed in quick succession by a number of other important public and private collections. In 1990 Ada Bird’s first solo exhibition was held at Utopia Art in Sydney and this was followed by exhibitions around Australia. Her works incorporate both traditional designs and representational elements and are best known for their linear patterns and minimal ornamentation. Yet many of her finest works, including that in the National Gallery of Australia are distinguished by a multitude of fine variously coloured dotting. These works, though rare, have proven to be particularly collectable. With an impressive exhibition history and a strong presence in the literature Ada Bird is one of Aboriginal Australia’s most collectable artists, if currently slightly out of fashion. Collectors should not be deterred by this. Important collections that hold her work include the Art Gallery of New South Wales, the National Gallery of Australia, the University of Queensland, the Holmes a Court Collection, the Kelton Foundation in Santa Monica, USA, and the Anthropology Museum, St. Lucia. The highest price achieved for a work by Ada Bird at auction was the $27,600 paid for the Delmore provenanced Atnangkere (Awelye) 1990 that had been exhibited at the Haywood Gallery, London, the Kunstsammlung Nordrhein-Westfalen in Dusseldorf and Gallery Gabrielle Pizzi, Melbourne. Sold at Sotheby's in June 1999 (Lot 97) it measured 151 x 122.5 cm, and exceeded its presale estimate of $8,000-12,000 by a significant margin. Another work, currently the artists’ second highest secondary market result, sold for $16,100 against an estimate of $8,000-12,000 at Sotheby’s a year later (Lot128). Women’s Ceremony for the Mountain Desert Lizard 1992 came from Mulga Bore Artists and was signed by Rodney Gooch on the reverse. It measured 230 x 164 cm. The work illustrated above is a fine example of her Mountain Devil Lizard Dreaming series depicting the Awelye body paint design for ceremony. Created in November 2003 it is an impressive work measuring 120 x 178 cm. with a particularly pleasing composition and striking palette.